1-2-3-4 CAKE IS A CLASSIC! 1-2-3-4 Cake is a classic that has been handed down from generation to generation. It is a wonderful basic recipe that is good for any occasion such as holidays, birthdays and anytime you just want a good cake. I can remember my mother making this 1-2-3-4 cake when I was young. Try this cake on your friends and family for a delicious treat they will love. 1-2-3-4 cake recipe will quickly become one you go to time and again. You can use any kind of frosting on this cake and I have added all kinds of ingredients for variety. 1-2-3-4 Cake is an old-fashioned classic. Cream butter and sugar with mixer until fluffy. Add eggs, one at a time, beating after each addition. Sift the flour you have already sifted again with the salt and baking powder. Add the vanilla extract and almond extract to the creamed eggs and sugar. Alternately add milk and flour to eggs and mix just until everything is wet. Spray a 9 x 13 baking dish with cooking spray. Add your cake mixture. Cook in preheated 350 degree oven for 35 to 40 minutes until brown on top and tests done in middle. Let cool before frosting. This cake is traditionally baked in three 9 inch cake pans for about 20 minutes per layer. You can do it in the cake pans or in a bundt pan, too. It will take about 40 minutes in a bundt pan. Frost with your favorite frosting or the frosting recipe below. Enjoy! Mix all ingredients with mixer. Spread on cake. Makes enough for 1 cake. You can double the recipe. If you like this recipe, you might also like my recipe for German Chocolate Cake. This cake is a classic that has been handed down from generation to generation. It's a wonderful cake to take to any gathering. Cream butter and sugar with mixer until fluffy. Add eggs, one at a time, beating after each addition. Sift the flour you have already sifted again with the salt and baking powder. Add the vanilla extract and almond extract to the creamed eggs and sugar. Alternately add milk and flour to eggs and mix just until everything is wet. Spray a 9 x 13 baking dish with cooking spray. Add your cake mixture. Cook in preheated 350 degree oven for 35 to 40 minutes until brown on top and tests done in middle. Let cool before frosting. Mix all ingredients with mixer. Spread on cake. This cake is traditionally baked in three 9 inch cake pans for about 20 minutes per layer. You can do it in the cake pans or in a bundt pan, too. It will take about 40 minutes in a bundt pan. I have used this recipe for cupcakes also. My mother had a secret “extra step” she took that makes this turn out even better. She separated the egg yolks and whites, then beat the whites until they were fluffy. She folded these i as the last step before pouring into pan. Makes a tremendous difference. Pamela, so your mom beat in the yolks 1st with everything, and then beat tge egg whites before folding them in? Or did she eliminate the yolks altogether and just used the egg whites in the recipe? I came across this recipe a few days ago, and saved it. Tonight, I was just craving something different, so I made a 1/2 cake. WONDERFUL ! Moist, light, lovely golden top. Couldn’t wait, and hubby and I ate half of it still warm, no frosting. I left out the almond, and doubled the vanilla, but that was the only change. Baked in an 8×8 for just about 30 minutes. I think next time I might line the pan with wax or parchment paper, as it stuck badly on the bottom, but that might have been too long a cooling or not enough pan-grease. I realize this comment is well over a year old. But maybe someone will be here now and find this useful. For baking, you can try one of the the following substitutions. 1/4 applesauce for each egg. 1/4 mashed banana for each egg. 1 tbsp ground flax seed plus 3 tbsp water for each egg. Mix until it’s fully absorbed and about the consistency of egg whites. 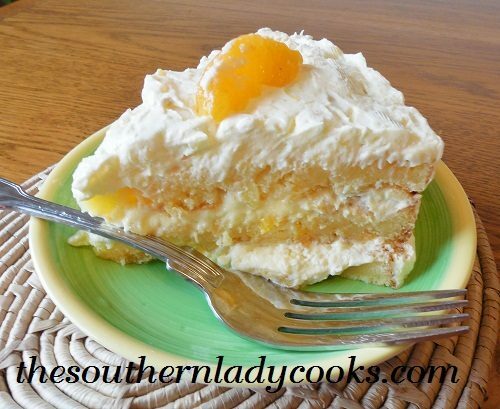 1234 cake was printed in 1928 Southern Cooking cookbook by Mrs. S. R. Dull. Mrs. Dull was Home Economics editor for the Atlanta Journal Sunday magazine. Mama said she thought the recipe may have originated at the company that made Swans Down cake flour. I have no idea. All I know is Swans Down make any good cake better. I’m going to make this today! Just curious if there is a big difference in using evaporated milk instead of milk? You can use regular milk. Evaporated milk has some of the water removed and is creamier, that’s all. I keep it on hand for if I run out of regular milk and use it in a lot of recipes. It sounds like you may have cooked it too long Jolene. Ovens do vary sometimes in temperature. Try cooking less time or even add a little more liquid to the recipe. Hope this helps. I haven’t thought about this recipe for years. Growing up in Kentucky, Mama use to make these for us in the 50’s and 60’s, and feeding and cooking for 7 people, she would probably make at least 4 of these a week. She used what she had on hand, and made this a very versatile recipe. If she were out of cocoa, she’d have to figure out what to do with it. Shortcakes, fried apples or peaches, fruit cocktail…brown sugar or vanilla icing, made cupcakes from it too. Marble cake. One of my favorites was when she made butterscotch pudding, poked holes in the cake, after it cooled and then pored the pudding over it and refrigerated it overnight. She was also a big fan of using evaporated milk when cooking or baking. Thanks for the memories. I’m baking one tomorrow after seeing your recipe. Love your recipes! Thank you so much for sharing with us, Daisy. These old recipes do bring back lots of good memories. Always happy to hear from another Kentuckian and happy to have you on our site. Hope you have a great weekend and week ahead. Curious if you have ever made this using an egg substitute. My grandmother always made a 1-2-3-4 cake. It’s the only thing we make! However my newest granddaughter is allergic to eggs. I am forever desperately trying to adapt this recipe. So far they have been either to moist in the center and/doesn’t rise in the center. I have been so fed up with all the different trials. There had been many! This last time I used for #1 egg-1t baking soda+1T vinegar; #2 egg- 1/4c greed yogurt; #3&4 eggs mixture of egg replacer 2T whipped with aquafaba 6T. It turned out a lot less moist in center but didn’t rise as much as needed. Any suggestions??? Sorry, I have never made it using an egg substitute, Vicki, but am posting your comment on the site and maybe someone else will see this and help you out. If you use cake flour do you still add baking powder and salt? Yes, you do. Add whatever the recipe calls for, Carolyn. I have made this cake several times and when I made it today I put three sticks of butter in on accident. Scatter brained! It came out awesome though! Love your site and thank you for sharing all of your lovely recipes. Can you use buttermilk in this recipe? I have not tried it with buttermilk but I see no reason why you couldn’t. My sister made 1,2,3, 4 cake for years. Need to check with her to see if this is the same one. Have lost so many of my recipes. Will try, but why is this called 1-2-3-4 cake? Because of the ingredients. 1 cup butter, 2 cups sugar, 3 cups flour, 4 eggs. Thanks for the delicious recipe!! When you use milk in your recipes, do you use whole milk? Or does it matter? What about fat free? I usually use 2 per cent unless I use evaporated milk. If I use anything other than the 2 per cent I will say so. I never use fat free. Hope this helps and happy to have you on the site, Jane. Can I use sweet ground cocoa or do I need the unsweetened? I think you could use either, Sherry. Would I need to cut back on sugar since cocoa has sugar in it? Since the recipe calls for powdered sugar and not granulated sugar, if you cut back on the powdered sugar it won’t make as much frosting. You could probably cut back a little but not much. Maybe 1/4 cup. Question: I would like to make this cake in one round pan. Which size round pan should I use? Thank you. You would have to cut the batter in half if you make it in a regular sized 8 or 9 inch round cake pan. It would be too much batter for one. I make this cake often. I call it the 1-1-2-3-4 cake because there is 1 cup of butter and 1cup of milk. Liquid non-dairy creamer works for the milk if you are lactose intolerant. I make icing with chocolate chips. I’ve never made a cake from scratch but I made this along with your caramel frosting and my family was blown away! I’m so glad to have found your website. Thank you so much for sharing your wonderful recipes. Im also making your Brown Sugar Meatloaf as we speak. My husband is a very happy man and he thanks you as well! So happy you all are enjoying the recipes, Kenya. Thank you for letting me know and hope you continue to enjoy. Have a great week. I have refrigerated this cake. I have left it out a couple days in cool spot, too. You can refrigerate it if you want. Thank you so much for sharing your wonderful recipes. I have found so many of my husbands favorites that he remembers from his childhood in the 1950s and 60s. He grew up in very rural communities, Blue John and Sloan’s Valley, in Pulaski County Kentucky near Somerset. We went there on our honeymoon four years ago. My folks are from Tennessee and some recipes I remember my Mother making. Thank you again for sharing! Thank you Jamie. So happy to have you on the site and happy you and hubby enjoy the recipes. I just made this today. Sure tastes a lot better than a cake from a boxed mix. I’ve pinned this for the next occasion on which I need a cake. It looks and sounds delicious! I am going to go make this cake right now. Judy, I LOVE your site and I have made many of your recipes. Please keep up the great work. Love this recipe, I like to splash the almond extract in last. It just takes this cake to a new level. My go-to recipe! Excellent with chocolate frosting, 7 minute frosting with coconut sprinkled on (and lemon curd between the layers), caramel, banana-you name it. I grew up with this recipe in the 50s and 60s. My mother made it almost every Saturday. You have my mouth watering! Mudt make this cake this week!